Wallabies players are not renowned for boasting strong overall Test success rates. That's because of the big, bad All Blacks boogey man. But Quade Cooper knows what is required to beat the Springboks, as shown by him being involved in seven victories in his nine Test matches against the Springboks - including triumph in his last five. So he was a natural to return for the Nelson Mandela Challenge Plate Test at Suncorp Stadium in Brisbane on Saturday. This is the perfect time for Cooper's reappearance after he was snubbed during the final months of Robbie Deans' reign. Starting Cooper against the All Black was always going to be dangerous due to the baggage. The horrors of the Rugby World Cup 2011 tournament remain. Working him off the bench during the Bledisloe Cup was a wiser move. But now back in his own domain, in front of a fawning home crowd, this is the arena where Cooper can truly perform. No inhibitions here. It is time for him to strut and hopefully reward the faith of his long-time provincial coach by providing Ewen McKenzie with his first Test victory. Cooper's promotion over Matt Toomua should not be treated as a slight on the Brumbies playmaker. It is simply a horses-for-course approach, and Toomua will get many more opportunities to control the Wallabies attack. McKenzie has also taken the right steps in demoting Jesse Mogg to the bench and moving Israel Folau from the wing to fullback. Mogg remains an uncertain resource, clearly struggling with the pressure during the Bledisloe Cup Tests and Super Rugby final. He needs time to think about it all, and work on certain parts of the game, in particular his defence and counter-attacking skills. Maybe his provincial coach, Jake White, was right when he said several months ago that Mogg wasn't quite ready for Test football. He will be, but not right now. The Wallabies' set-piece has to be up to it. So far this season, it hasn't. Folau at No.15 is in the right spot for him. He showed that during the final rounds of the Super Rugby tournament with New South Wales Waratahs. 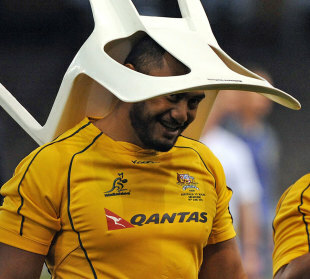 But it is also up to Folau to inject himself more into the game. He can blame team-mates for not getting a fair go on the wing, but not at fullback. The attention is right on you, Izzy. And the value of club football is rammed home yet again with Nick Cummins moving onto the wing. No doubt the "Honey Badger" confirmed his selection by excelling for Southern Districts in the Shute Shield elimination final against Randwick at Coogee Oval on Saturday, which included a spectacular acrobatic try just in front of the legendary Mark Ella Stand. Let's just hope that the new Test tight-head prop, Sekope Kepu, has better initial memories of the Springboks international than of the fixture at Coogee. Kepu went on as a replacement and, just seconds on the field in his first set-move, was part of a Randwick scrum decimated by their opponents, resulting in a tight-head victory and from that a Southern Districts try. That moment was a reminder of what will be crucial in Brisbane. The Wallabies' set-piece has to be up to it. So far this season, it hasn't. Wallabies: Israel Folau; Nick Cummins, Adam Ashley-Cooper, Christian Leali'ifano, James O'Connor; Quade Cooper, Will Genia; Ben Mowen, Michael Hooper, Scott Fardy; James Horwill (captain), Rob Simmons; Sekope Kepu, Stephen Moore, James Slipper (Queensland Reds). Replacements: Saia Fainga'a, Scott Sio, Ben Alexander, Kane Douglas, Jake Schatz, Nic White, Matt Toomua, Jesse Mogg.